Philosophers and mystics have long contemplated the disconcerting notion that the fixed self is an illusion. 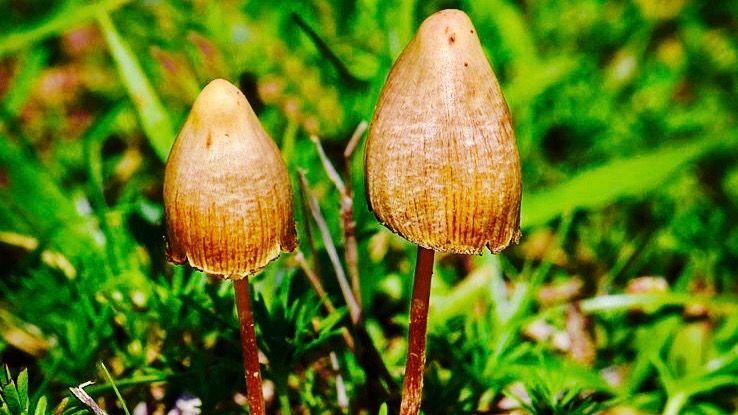 Neuroscientists now think they can prove it or, at least, help us glimpse this truth with some help from psilocybin, the psychoactive property in magic mushrooms. Researchers around the world are exploring the drug’s transformative power to help people quit smoking; lower violent crime; treat depression, anxiety. and post-traumatic stress disorder; and trigger lasting spiritual epiphanies in psychologically healthy people, especially when coupled with meditation or contemplative training. There are some limitations to psilocybin studies—they tend to be small, and rely on volunteers willing to take drugs and, thus, open to an alternate experience. But the research could have major implications in an age characterized by widespread anxiety. Psilocybin seems to offer some people a route to an alternate view of reality, in which they shed the limitations of their individual consciousness and embrace a sense of interconnectedness and universality. These trips aren’t temporary, but have transformative psychological effects. Even if we don’t all end up on mushrooms, the studies offer insights on how we might minimize suffering and interpersonal strife and gain a sense of peace. Consider a study of 75 subjects, published in the Journal of Psychopharmacology last October. The study concluded that psilocybin leads to mystical experiences that can have long-term psychological benefits in conjunction with meditation training. The greater the drug dosage, the more potent the positive psychological effect was six months later. “Participants showed significant positive changes on longitudinal measures of interpersonal closeness, gratitude, life meaning/purpose, forgiveness, death transcendence, daily spiritual experiences, religious faith and coping,” the study concluded. Meanwhile, in July, psychologist Richard Williams of John Hopkins University revealed an experiment involving clergy and psilocybin. Williams is enlisting priests, rabbis, and Zen Buddhist monks to take drugs, meditate, and “collect inner experiences.” (No Muslim or Hindu clerics agreed to participate.) The study will last a year, so no results are out yet. But Williams told The Guardian in July 2017 that so far, the clerics report feeling simultaneously more in touch with their own faith and greater appreciation for alternate paths. “In these transcendental states of consciousness, people … get to levels of consciousness that seem universal. So a good rabbi can encounter the Buddha within him,” Williams said. To understand how mushrooms can change our worldviews, we must first explore how brains shape our sense of self. Yet when you are unconscious, you continue to exist without perceiving your own presence. You cease to participate in reality but continue to live. When roused back into consciousness, you lack a narrative to explain the time away. The narrative of the story that seems to be your life is just a function of your brain’s mechanisms, not who you really are. Still, the hallucination of consciousness is one we’re all having in tandem. When we agree about our hallucinations, we call it “reality,” according to Seth. In this agreed-upon reality, we are each separate individuals, whose stories begin with our births and end with our deaths. But there are other ways to experience reality, which you may have already glimpsed, even if only fleetingly. Sometimes our consciousness shifts. The boundaries of the self seem to become less rigid and we commune with another person or thing, as can happen during drug-induced epiphanies, sure—but can also happen when people fall in love, meditate, go out in nature, or experience a great meeting of minds. Seeing the interconnectedness and timelessness of existence provides a grand scale. It helps put your problems in perspective. That’s why scientists are trying to find ways to trigger the epiphany Watts talks about. Drugs can help, especially since we think we now know how the brain generates the illusion of self. Carhart-Harris and his colleagues found what seems to be an important function of the DMN inadvertently. While studying brain networks, they got curious about what changes might occur when people are under the effects of hallucinogens. In studies analyzing the effects of psilocybinon brain wave oscillation and blood flow, they found that when the DMN was inactive, an alternate network of consciousness seemed to arise. When some study subjects tested psilocybin, they reported a strong sense of interconnectedness, as well as spiritual, magical, and supernatural feelings. In the alternate mode, brains produced a different world that offered other sensations and realizations than in everyday life. In this mode, the self wasn’t the protagonist of the narrative. Meanwhile, scans of blood flow and brain wave oscillations showed new, unusual—but orderly and synchronous—connections forming between cortical regions, as if the brain was reorganizing its network. This led Carhart-Harris to posit that the DMN generates the feeling we each have that we’re individuals, a feeling that manifests very strongly as reality. And that means we can temporarily switch off, or mute, this part of the brain. According to psychoanalytic theory, the feeling of having a personal identity is known as the ego. It’s the boundary-maker and gatekeeper, drawing lines and dividing me from you. But as psychoanalyst Sigmund Freud notes in his 1930 essay “Civilization and Its Discontents” (pdf), the ego is mutable. Our sense of identity can shift—from infancy to adulthood, within relationships, and with certain practices, like meditation. Living in a society means living within certain limits, for our own safety and that of others. We need the ego to draw lines, protecting us from people who may take advantage of too much kindness or too open a spirit. But muting the ego can be a good thing. Switching off the default mode changes the connections between cortical regions and activates new modes, new sensations and thoughts, allowing us to “lose the inhibiting influence on one’s own narrative, which leads to insights that are kept from consciousness,” Carhart-Harris says. Experiencing this state of uninhibited consciousness can lead to lasting changes, even after the psilocybin wears off. For someone who is severely depressed, changing brain activity with psilocybin may be able to jolt them out of a cognitive rut, wherein their default mode repeats negative thoughts and feelings in a damaging loop, Carhart-Harris explains. And in someone who is psychologically healthy, the additional perspective provided by a peek at the alternate consciousness can also improve overall well-being. As Shelby Hartman wrote in Quartz last January, the data (pdf) from three trials of psilocybin in 36 healthy volunteers showed that brief drug-induced mystical experiences changed people over time, leading them to report better moods, heightened altruism and forgiveness, more closeness with others, and a sense of connection six months later. Two-thirds of study subjects rated the experience during a psilocybin session so meaningful that it fell within their top five life events, up there with the birth of a first child, for example. The researchers believe the memory of the drug experience—the trip, if you will—continues to influence people long after the drug itself has technically worn off. Psychologists distinguish radical transformative experiences as “quantum changes,” as opposed to incremental behavioral-based shifts. But the two are not mutually exclusive. An epiphany prompted by psilocybin can give rise to a new enthusiasm, curiosity, or sense of wonder that can trigger behavioral changes or new interests, spurring travel, dance, contemplation, meditation, an interest in nature, people, or other cultures. Likewise, no momentary experience is so magical and profound as to make every moment thereafter easy to manage, which is why practitioners of meditation may experience illumination when sitting, but still struggle in day-to-day life. Dissolving the ego doesn’t happen once and for all. The default mode network will resume its duties, and it can be hard to stay in touch with alternative states of consciousness. The epiphanies some people experience on drugs, then, offer a touchstone to which we can return when the brain’s default mode is on. That’s why neuroscientists are so interested in finding out how mystical experiences can be combined with meditation practices and other forms of spiritual guidance, the better to bring about lasting change. For Trungpa, expanded perceptions of alternative forms of consciousness were not a particular prize, but a tool to be applied to everyday life. An epiphany may be initially thrilling, but that’s not the point. Trungpa advocated existential cool. You don’t have to shout from the rooftops about how we’re all one interconnected organism, or feel lonely when the ego howls its song of alienation.